Near the Oregon Coast Aquarium in Newport, visitors will find the Hatfield Marine Science Center. This is a great place to continue your marine education. Then it’s time to discover places where you have opportunities to see whales. We’ll explore four such sites. The Hatfield Marine Science Center (HMSC) is run in conjunction with Oregon State University. It’s a campus of laboratories and classrooms where OSU scientists and students, along with numerous state and federal resource agencies, conduct world-class research on marine topics. These are the Oregon and U.S. fish and wildlife agencies, the EPA, NOAA, U.S. Geological Society, and the Marine Mammal Institute. OSU started its connection to Newport in 1939 with a biology lab. The University then worked with the port, whose land they rent, to open the center 51 years ago. The Visitor Center’s objective is to bring the work of the science center to the public through lectures, films, seminars, exhibits, and special events. It’s one of 22 Coastal Ecosystem Learning Centers nationwide that's teaching, sharing research, and informing the public about coastal and marine habitats. Oregon Sea Grant, in partnership with OSU, manages the center. Many exhibits concentrate on research done at the facility over the years. Among the notable accomplishments by OSU marine scientists are their work on physics and plate techtonics, undersea volcanos, sea star wasting disease, ocean acidity, marine aquaculture, and Pacific whale research. Some exhibits change regularly. Others, such as the live animals, are permanent. They’re arranged in a loop, with many exhibits placed back-to-back, so it’s wise to take another path back through so you don’t miss anything. 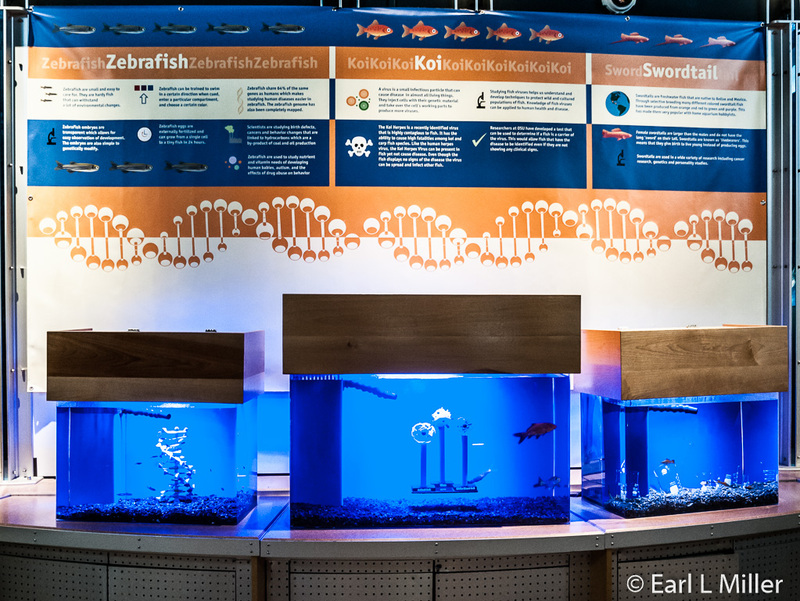 You’ll see displays on weather, tsunamis, commercial fishing, ocean resource management, microscopic sea life and more. Drawing a lot of attention are the center’s Giant Pacific octopus and the touch tank of tide pool creatures. Unfortunately, the octopus wasn’t there in August as they only keep this animal about six months before releasing it to the ocean. The Center was in the process of obtaining a new one. 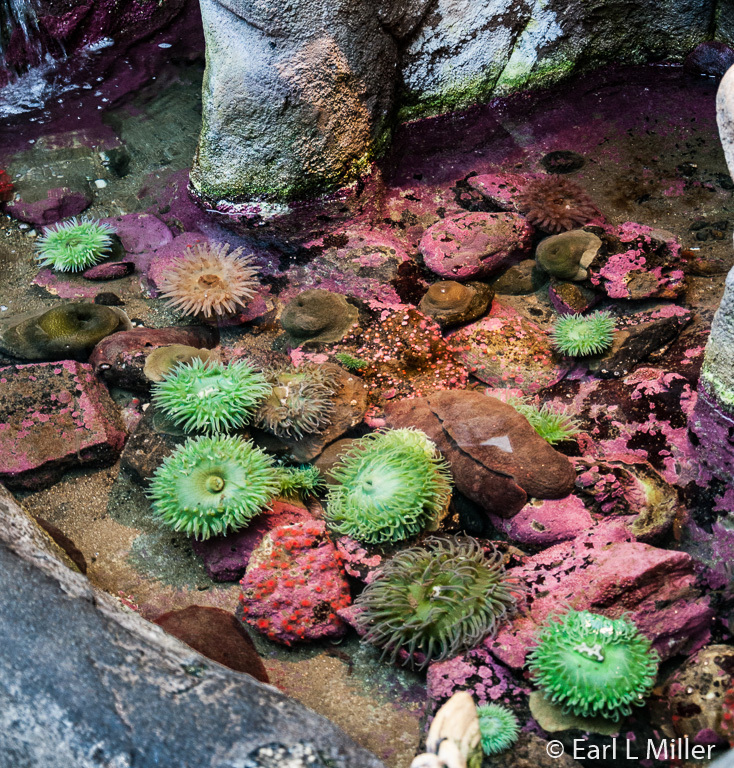 At the touch tank, feel free to gently touch a sea cucumber, abalone, several species of sea anemones, sea urchins, and three varieties of sea stars. One set of aquariums has Copper rockfish, Rock sole, and a Wolf eel. Another group has Zebrafish and Swordtail fish. You can see Dungeness crab larvae by looking through a microscope. The Tsunami Wave Tank is an interactive. You can build your own structure with Legos, use a computer to create a tsunami wave, and see if your building withstands the blow. This display also teaches about the life cycle of a tsunami. The Erosion Tank allows all ages to experiment with conditions causing coastal erosion. You can make a beach, use a bar to make waves in the tank, then observe the pattern of erosion the waves make on your beach. Learn what happens to a beach with a sea wall or a jetty or make your own design to help protect the beach from erosion. Discover how wind creates waves and how waves are being harvested for electricity. Find out about sustainable fisheries. Read what gear is used to catch fish off the shore and the science of sustainability as it applies to Chinook salmon, albacore tuna, Dungeness crabs, and pink shrimp. Check out the evolution of trawler gear. 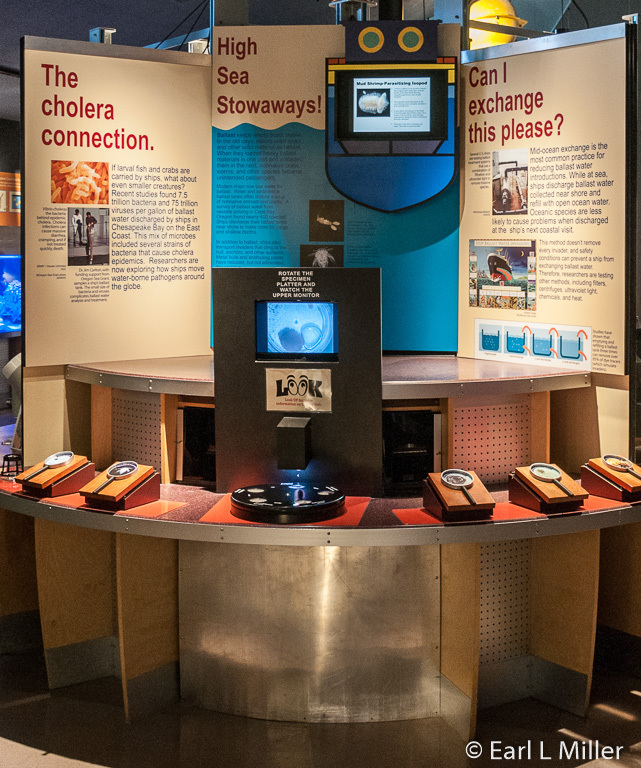 You’ll see exhibits on earthquakes such as why they occur in the Pacific Northwest and the technology of warning systems. View a rumblemeter. It’s a recording device containing sensors measuring different water pressures caused by changes in volcanic activity. You’ll learn about the research OSU has done about the sea star wasting syndrome which started in the state of Washington. In June 2013, it was the largest die-off of this species.The stars get a lesion followed by extreme tissue decay. Their limbs literally “walk away” from their body causing the star to rupture and die. The body disintegrates leaving a pile of gelatinous waste within a few hours or a few days. Scientists have discovered a link between the Densovirus and sea star wasting. You can feel different textures, hidden from view, such as wood or mussels and try to identify them. You can also listen to sounds such as a humpback whale, fin whale, harbor seal, and an earthquake. Learn about beach balls, not the plastic kind. Some are made of vegetation such as sea or dune grass. Others arise from pine needles, seaweed bits, or woody twigs. 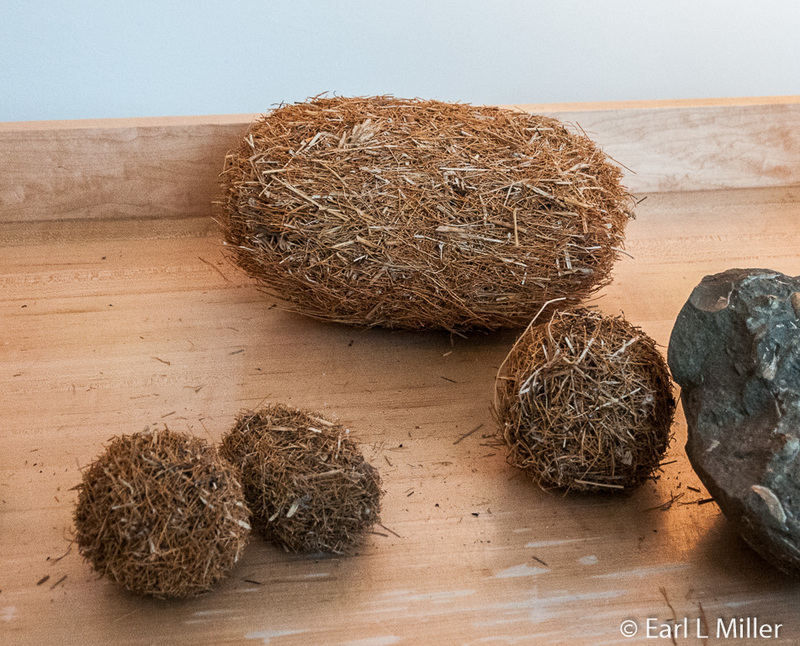 Several types of balls are there for you to touch. The Center also relates how the decline of sea otters has destroyed kelp forests. Sea otters kept the sea urchin population under control which fed on kelp. With the otter decline, the kelp forests have been decimated. One exhibit discusses what factors caused the marked decline of the Steller sea lion population in the 1980's and 1990's, causing it to go from threatened to endangered, even though the species was protected. Check out “Gifts from the Sea.” They’re used in food and medicine and as raw materials. For instance, compounds in sponges have been used as part of the cure for herpes. 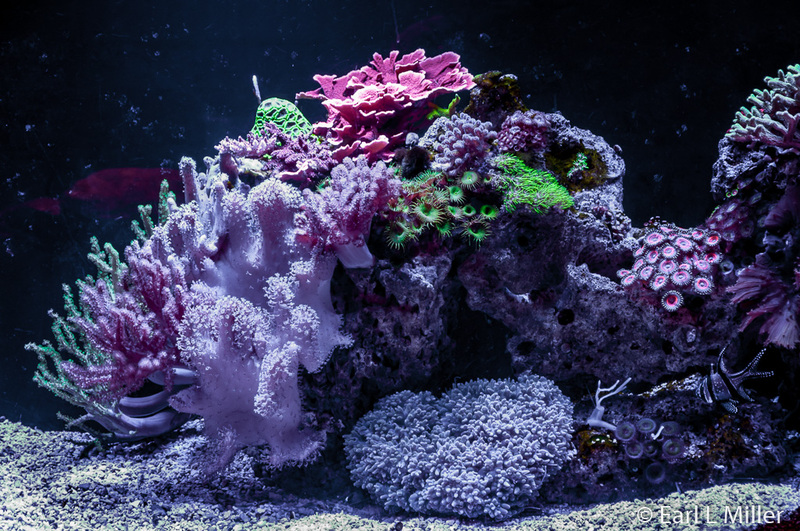 Sea squirts can help control tumors and coral has been used to treat bone tumors. The squid’s nerve cells have been helpful with neurology research. Seaweed has been used in fertilizer. There is a section on whales. Pick up each of several phones to listen to whales. Look at the 12 bronze sculptures of the different species including gray, blue, and bowhead. 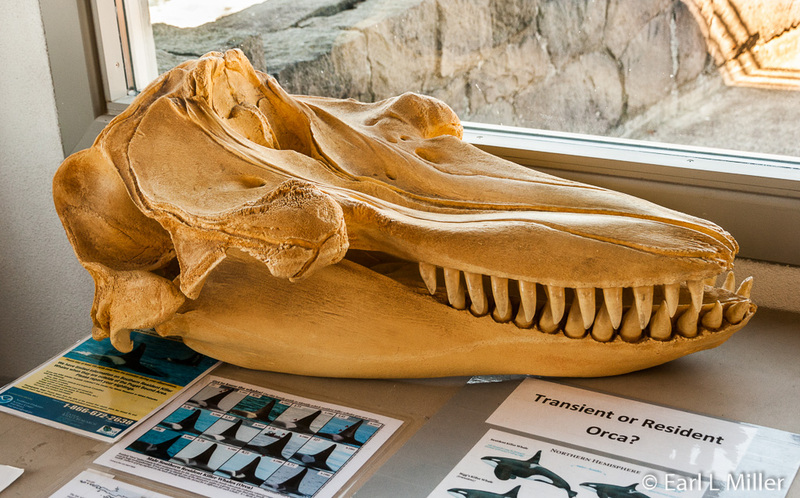 On display is a killer whale’s skull. 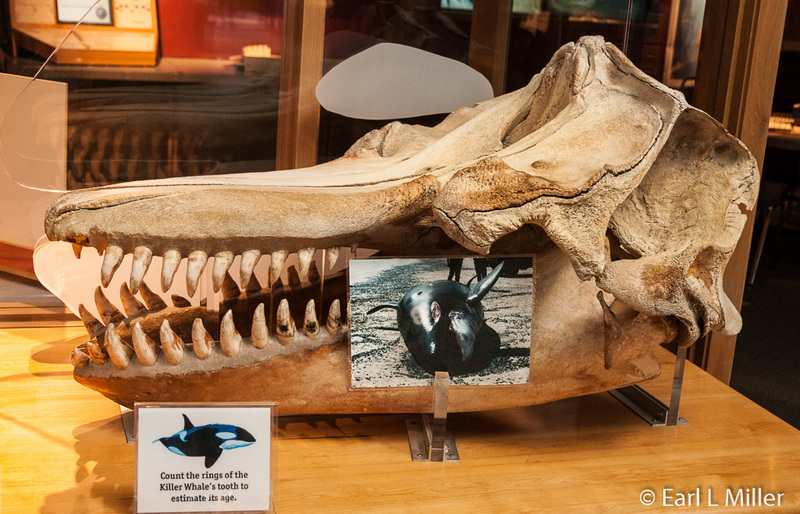 Signage relates that scientists can estimate the age of a killer whale by counting the rings of teeth it has. Sometimes OSU professors or researchers give lectures. To find out about these and other events, go to the Center’s web site. If there are no lectures, you can select to watch a movie instead. These cover such topics as whales to Cuttlefish. We watched the one hour film on Cuttlefish and found it fascinating. Found in South Australia, the Cuttlefish can change its shape and color within seconds to morph into its environment. They are cephalopods, not fish, and are related to squids and octopus. They rely on their eyesight to match the colors of their surroundings. This information is fed to their brain which tells special skin cells what colors to change into. They use their camouflage mostly to hide from predators. Their next defense is to eject an inky cloud. The males outnumber the females. Sometimes the males dress up as females to drift past the larger males in order to mate with the females. Females reject 70% of the males, 35% of the cross dressers. The female lays up to 100 eggs then dies. Cuddlefish only live for one to two years. Outside you can follow a half mile trail from the east side of the parking lot. It has signs telling about the estuary, its ecology and benefits. You’ll also notice some interesting exhibits at the Center’s entrance. The walk way approaching the center is a nautilus design with a sign asking what a nautilus and an octopus have in common. They are both mollusks, belonging to the cephalopod family. They have tentacles for touch and taste and a very complex nervous system. 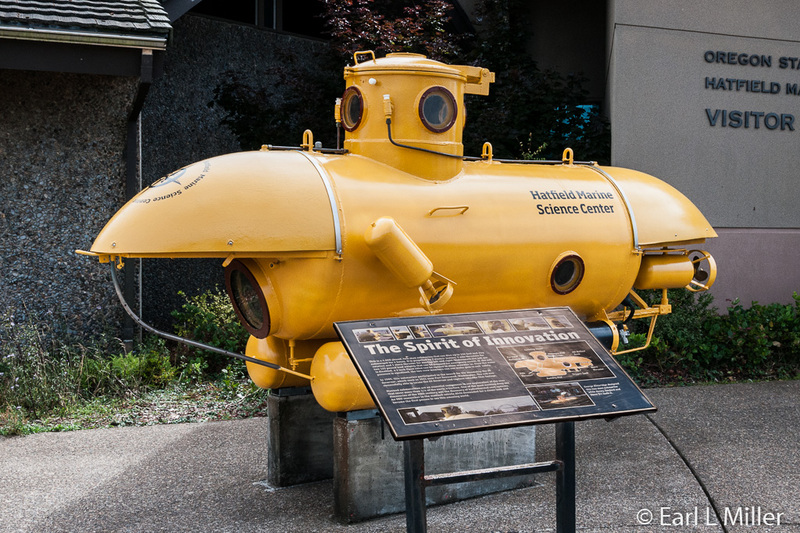 The two man submarine on display weighs 4,000 pounds and was able to dive down 350 feet while being able to be submerged for up to four hours. 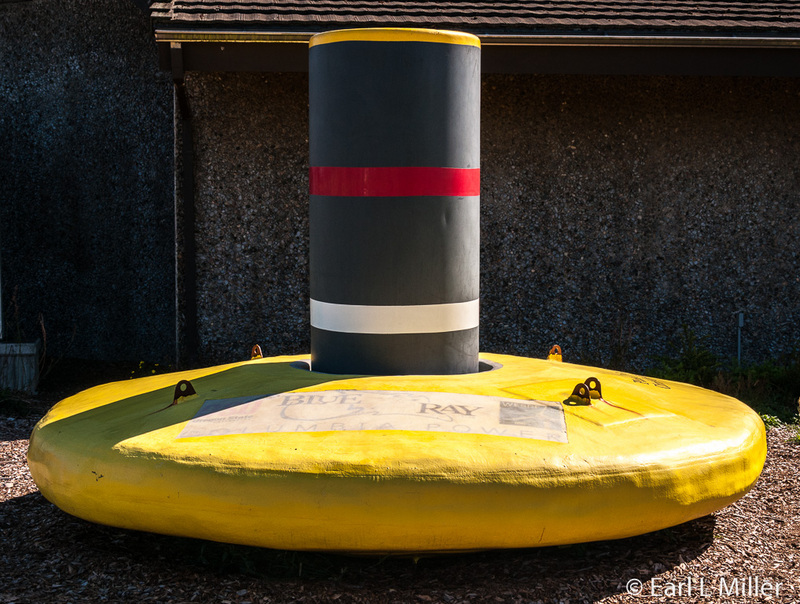 In 1985, this submarine participated in the search for the SS Governor which sunk in 1921 near Port Townsend, Washington. The sub was successful in locating the ship and captured valuable footage. The ocean wave buoy prototype is on display with a sign explaining wave energy. HMSC is a base for the Northwest National Marine Renewable Energy Agency. The tsunami dock was ripped from its mooring during the tsunami in Japan in March of 2011. Due to its flotation device, it washed up on Agate Beach in Newport on June 5, 2012. Scientists studied more than 118 different Japanese species on this one piece of debris. The state of Oregon had the dock removed with the exception of a few pieces used for interpretative purposes. The Visitor Center is open daily Memorial Day to Labor Day 10:00 a.m. to 5:00 p.m. Then it’s 10:00 a.m. to 4:00 p.m. Thursday through Monday the rest of the year. The address is 2030 S.E. Marine Science Drive in Newport near the port. The phone number is (541) 867-0226. Admission is free with donations accepted. 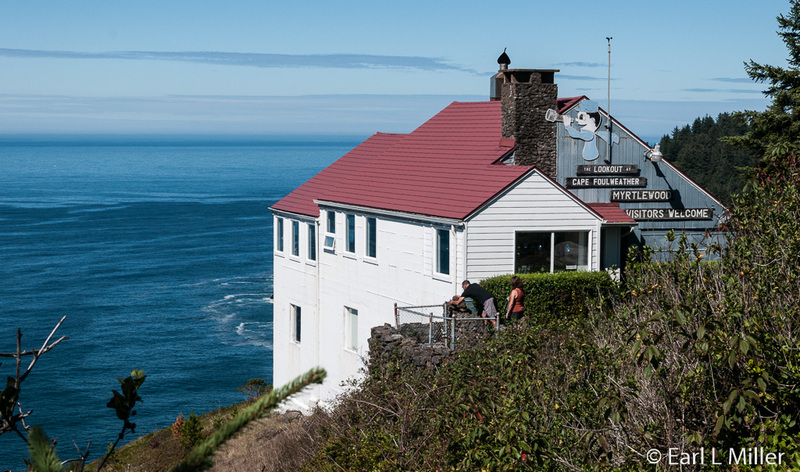 In Depoe Bay, north of Newport, you’ll find the Whale Watch Center. The area in 1930 was a wayside parking area. In 1956, it became a wayside restroom facility. It was operated by the Oregon Department of Transportation until 1988 when it was taken over by Depoe Bay. When the state resumed control in 2005, it became a lookout for watching gray whales with exhibits about marine mammals. The center has no admission and has binoculars for use. The Center had a table of items found on the beach which you could handle. These included surf balls, a sea star, agates, a sand dollar, shell fossils, and driftwood. The most common displays we saw were signboards. Information on California sea lions and Harbor seals were accompanied by their skulls. There was signage on shorebirds and a book revealing the various types of species. Another explained why whales were hunted. They were sought as food and for their oil. Obtaining baleen was another reason since it was used in buggy whips, umbrella ribs, and combs. Gray whales are baleen whales. When they feed on crustaceans on the ocean floor, they roll on their sides and scoop up water and sediments. They force the water and sediments out through their fringed baleen plates hanging from either side of their upper jaw since they don’t have teeth. This is the way they filter their food. The center has a sample of baleen. 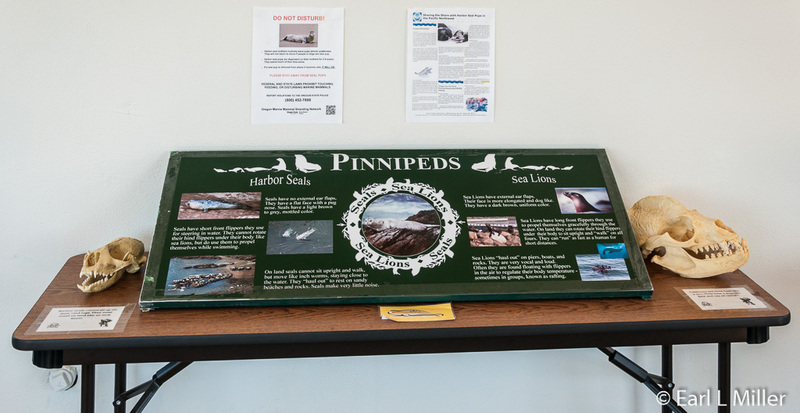 Signage includes information on such subjects as the ocean’s food chain, Gray whales, dolphins and porpoises, and whale migrations. We saw the skulls of an Orca, a Pacific White-sided dolphin, and a Harbor porpoise. We also spotted a Gray whale’s lower jaw bone, humerus and ulna vertebrae from his pectoral fin, and rib bone. You can also linger outside at the seawall to spot whales and observe the many fishing vessels, Coast Guard craft, and whale tour boats. Approximately 2,500 Gray whales are observed each year from the center. While you are there, pick up their brochure “Whale Watching Center.” It has a map and list of the 24 best whale watching sites ranging from Ilwaco, Washington to Crescent City, California. These are numbered from north to south. All sites in this article, except for Hatfield, are listed on this map. Want that list earlier, go to Visitor Oregon Coast.com on whale watching. The link to it is http://visittheoregoncoast.com/whale-watching. This site also lists whale watching boat tours and airplane flights. The time of year that you visit is a major factor in seeing whales, mostly gray whales, since two migrations occur a year. The winter migration, from Alaska to Baja, California, occurs from the last week in December through the first week in January. Winter weather can make observation difficult with rough seas causing the whales to travel farther from shore. Spring migration occurs the last two weeks in March. However, mother and baby whales might not migrate until late May or early June. The whales travel closer to shore, from a half mile to three miles out and viewing weather is better. Many “Resident” gray whales, about 200, don’t venture any further north than the Oregon Coast and can be viewed year round. They feed on crustaceans hovering around the kelp beds. They stay very close to shore. Other species you might spot during the year are Minke, Humpback, Blue, and Sperm whales. Orcas, the largest of the dolphins, are also seen in Oregon. In mid September, we saw two whales as we stood on the promenade that leads from the center. For those who want closer views of whales, Depoe Bay offers several whale watching cruises. Some use Zodiac boats while others use fishing boats. If you are lucky, you’ll catch the whales performing some of their behaviors - blowing, breaching, spyhopping, and diving. Gray whales usually surface every 45 seconds as they swim. When they are eating, they can stay under for three to five minutes. When they have been down five minutes, they usually blow five times. That’s to replenish their oxygen. The blow shoots nearly 12 feet. Breaching occurs when a whale launches half to 3/4 of its body out of the water, then falls on its side or back, creating a tremendous splash. Gray whales don’t breach as often as Humpback whales. However, young Grays are the most common breachers along the Oregon Coast. Scientists aren’t sure why whales perform this behavior. Spyhopping is lifting their heads above the water surface to get a better sense of where they are. Gray whales do that regularly particularly when they are near tour boats. A deep dive is called sounding or fluking. This helps propel the whale downward to the bottom where he can feed on crustaceans. The dive’s turbulence, once the flukes disappear, causes a circle of smooth water called a fluke-print. The Center is open every day during the summer and Wednesday through Sunday during the fall, winter, and spring. Its address is 119 S.W. Highway 101, Depoe Bay. The telephone number is (541) 765-3304. 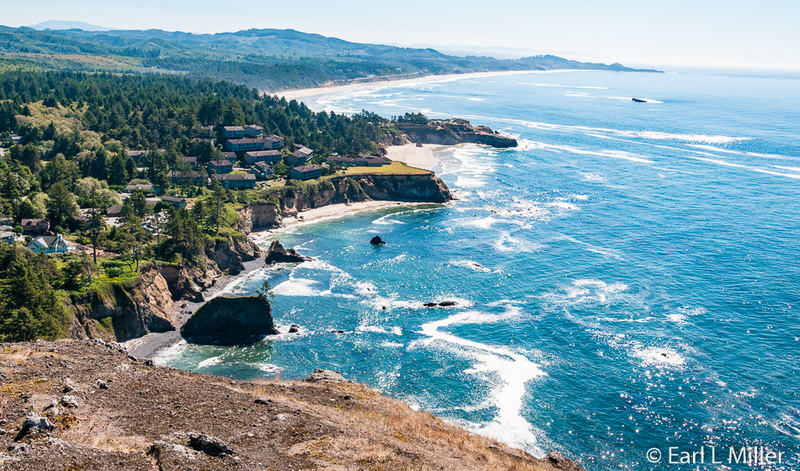 Located south of Depoe Bay, next to Whale Cove, we found Rocky Creek State Scenic Viewpoint. It’s an oceanfront park on a forested bluff overlooking the ocean where offshore rocks provide nesting areas for birds, sea lions, and Harbor seals. There are picnic tables and restrooms with flush toilets here. On our return from the Whale Center, we stopped here and had good luck. We spotted four whales, including one that seemed to be following the shore. We also saw two Zodiacs that knew where to head for closeup whale action. They quickly came near the whales we were watching. Our next stop was Cape Foulweather. 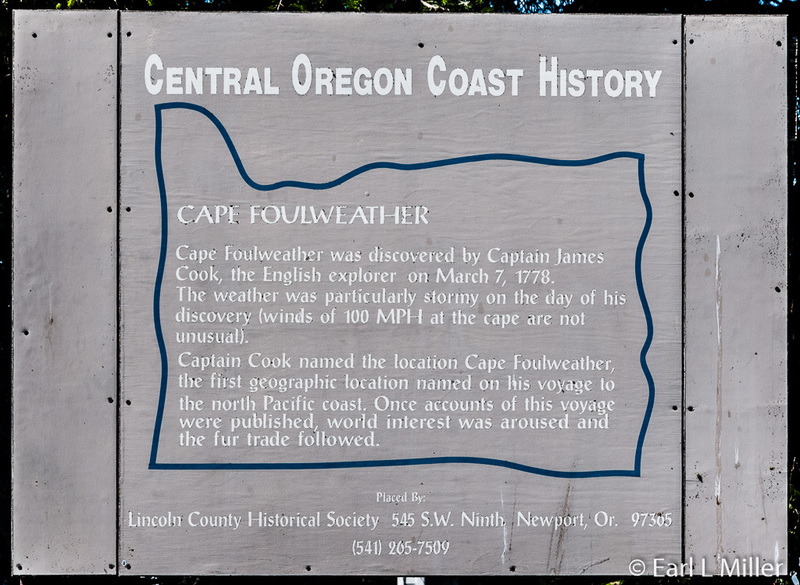 This cape was first sighted by Captain James Cook in 1778 during his search for a passage to the Atlantic from the Pacific Ocean. It was the first promontory he named on his 5-day journey along the Oregon Coast. When Cook’s account was published, world interest was aroused and the fur trade followed. During the 19th century, the only man-made structure, at this site called “Bald Knob,” was a stagecoach station serving passengers between Depoe Bay and Newport. In 1934, Buck and Ann Badley purchased 160 acres of land and the station. They began construction of the “Fair Weather Coffee Bar.” In 1937, they finished building on the Lookout and lived in the estate that included their homes, those of their caretaker and his family, and other outbuildings. Within a few years, they learned that having a coffee shop was not successful financially. They made it into a gift shop. Among their most popular items were pillow cases with the word “Mother” printed on them in big letters and postcards of the Oregon Coast. They also installed telescopes to view the ocean and coastline at a price of 10 cents for 20 minutes. 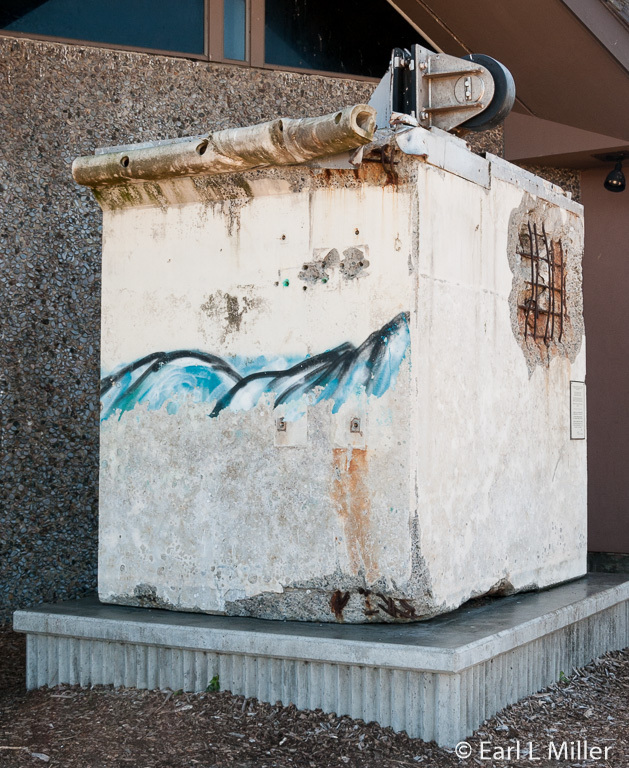 Between 1942 and 1944, because of fears of a Japanese invasion, the U.S. Coast Guard station in Newport used the building’s basement for air and sea surveillance. Ann Badley continued to run the gift shop upstairs and cooked for the six men stationed there. Buck Badley worked at shipyards in Portland. Buck Badley passed away in 1964. Ann sold the lookout but continued to live there until shortly before her death in 1990. In 1994, the homes and other outbuildings were razed. A series of owners operated the shop until it was purchased by Ralph and Katherine Peyton in 1977. Since 2013, it has been owned and operated as an Oregon State Park facility. Half of the building is now dedicated to indoor viewing and for interpretation. Visitors can still purchase souvenirs of their visit to the Coast. Telescopes are no longer available. Instead, visitors find binoculars they can borrow for free viewing as long as they stay inside the gift shop. The promontory is well known as a whale and other sea life watching spot and for great views of the Pacific. While we enjoyed the view, we did not see any whales when we were there in September. It is located south of Depoe Bay just off U.S. Route 101. South of Cape Foulweather, we located Devils Punchbowl, a day use park. 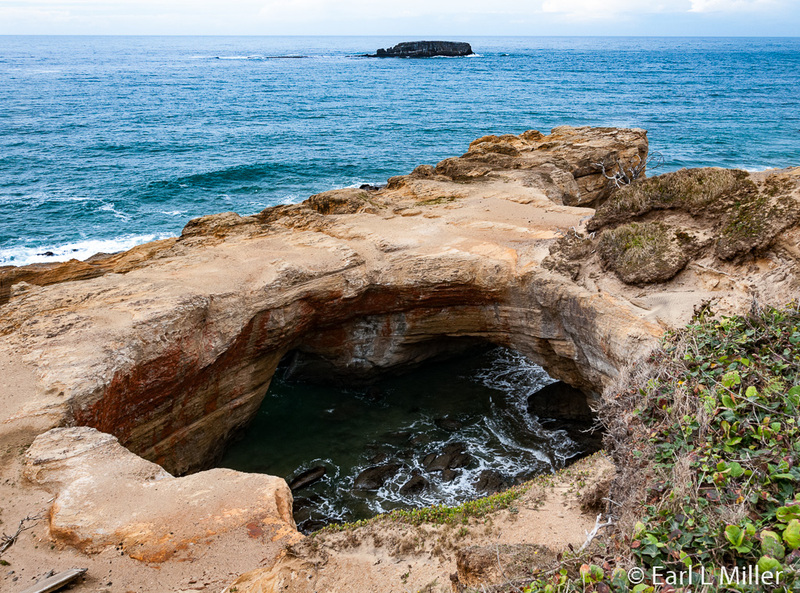 The water slams with a thundering roar into a hollow rock formation, shaped like a huge punch bowl, that is partially open to the Pacific Ocean. The surf then foams and swirls as it mixes together. It’s presumed that the formation was created when two caves carved by the ocean collapsed. It is known for its whale watching though again we didn’t see any. We did see a picnic area and they do have restrooms with flush toilets. A trail exists for beach access and the tidepools located on the formation’s north side. It is located about five miles south of Depoe Bay and eight miles north of Newport. It’s about a quarter mile west of U.S. Route 101.